The D15 is 1.5-liter four-cylinder engine of the D-series used in small vehicles such Honda Civic. The D-series also includes the D12, D13, D14, D16, D17 engines, but D15 is the most popular engine in those days. The engine has aluminum cylinder block with cast iron sleeves. There are three cylinder head types depended on modification: 8 valve, 12 valve, and 16 valve heads. The most common engine is the D15B with 16 valve cylinder head. Also, the engine can be SOHC or DOHC and might include VTEC variable valve timing system. The engine has a timing belt. The valve train hasn't hydraulic lifters; there are solid tappets. The valve clearanceу needs in adjusting every 25,000 miles (40,000 km). Earlier versions are equipped with carburetor controlled by a computer. Then the manufacturer moved to the single port injection called PGM-CARB, and after that, they installed the new multipoint fuel injection. The engine has a long history, so the full list of modifications you can read below. Crankshaft pulleys often break on D15B. The problem is solved depending on how it all happened, by replacing the pulley to replace the crankshaft. Float engine revolutions. The issue is not standard, but it happens sometimes. The most common reason is dirty throttle valve and the sensor (or valve) of idle. Cleaning from dirt will help or improve the situation, also look at the oxygen sensor (lambda probe). Diesel sound from D15B is a sign of a crack in the exhaust manifold. Do not hurry to weld this crack; it will not help for a long time. Save some money and buy used or aftermarket manifold. D15B distributors are not reliable of this engine. The engine shakes or doesn't start at all. Despite those small troubles, the D15 is the reliable and robust engine. The engine life is more than 150,000 miles (250,000 km) with any problems. In our day is a big deal to find this engine with small mileage. 1. 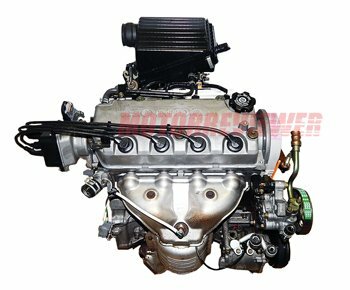 D15A1 - the first engine in series, carburetor, 12 valve, 9.2 compression ratio, the power is 76 hp. Produced until 1987. 2. D15A2 - 60 hp 8-valve version with 10 to 1 compression ratio. Production was stopped in 1987. 3. D15A3 - 12 valve engine with fuel injection, compression ratio - 8.7. Its power is 91 hp and 99hp. 5. D15B VTEC - the analog on injection D15B with VTEC, compression ratio now is 9.3, the power is 130 hp. Produced from 1992 to 1998. Since 1995 the engine has 3-Stage VTEC. 6. D15B1 - 71 hp 8 valve fuel injection engines with changed connecting rods and pistons, compression ratio is 9.2. The production was from 1988 to 1991. 7. D15B2 - 16 valve version of D15B1 produced 92 hp. It was produced from 1988 to 1995. 8. D15B3 - 16 valve engine with a carburetor. CR is 9.2, and power is 106 hp. Produced from 1988 to 1996. 9. D15B4 - the same D15B3 with dual carburetors, power is 101 hp. The production began in 1989 and ended in 1993. 10. D15B5 - new pistons and conrods, cylinder head, VTEC-E.
11. D15B6 - 8 valve engine with pistons and rods from D15B1, 9.1 compression ratio, 62/72 hp. Produced from the 1988 to the 1991. 12. D15B7 - 16 valve version of D15B6, the power of 103 hp. Produced from 1992 to 2000. 13. D15B8 - 8 valve fuel injection engine, 9.1 compression ratio. 14. D15Z1 - 16 valve engine, fuel injection, modified VTEC-E, another pistons, compression ratio is 9.3, 90 hp. 1992-1995 years. 15. D15Z3 - analog of D15Z1, the new VTEC system firmware. 16. D15Z4 - 16 valve engine with modified pistons and cylinder head. The power is from 90 to 105 hp. Production Years: 1994-2000. 17. D15Z6 - analog of D15Z4, modified head, VTEC, 9.6 compression ratio, 114 hp. Production is from 1995 to 2000. 18. D15Z7 - analog of D15Z6, system Lean Burn, modified VTEC system, 130 hp. It was produced from 1996 to 1999. 19. D15Z8 - analog of D15Z6, slightly changed VTEC system and cylinder head. 20. D15Y3 - 16 valve VTEC engine, 117 hp. Production: 2001-2006. 21. D15Y4 - analog of D15Y3 with VTEC-E.